2009 Carolina Classic 35 Don't miss this one of a kind 2009 35 Classic with low hours. 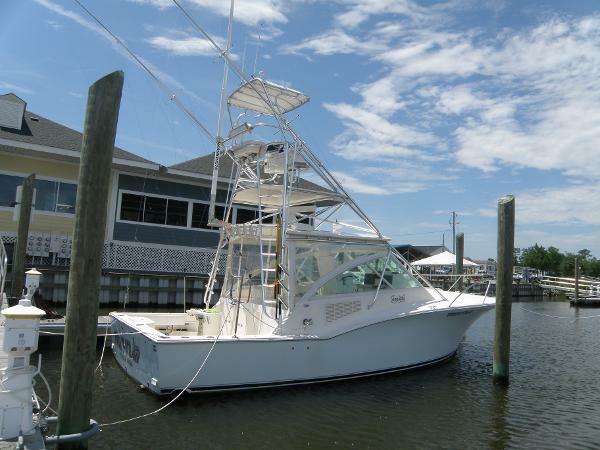 This beautiful ice blue Carolina Classic is completely decked out and ready to fish. She is hands down the nicest on the market. At the stern is a large transom door and livewell. In the cockpit are 2 large fish boxes, a pedestal with rod holders and a cutting board, plenty of tackle drawers, drink cooler, fresh water sink, refrigerated fishboxes, storage under the gunwales for gaffs and hoses, outriggers, and a brand new green stick professionally installed for tuna fishing. In the tower are rear and side facing LED flood lights for night fishing. The helm area features a large L-shaped lounge, 2 custom helm seats, and heat/A/C. She is equipped with new state of art Garmin electronics to include 2 touch screen Garmin displays, Garmin auto pilot, Icom VHF, remote search light, FLIR night vision camera interfaced with the Garmin display, and a high end fusion stereo package. There is also a 10 inch Garmin display in the tower. Down below there are accommodations for 4, a full galley, head, and a TV. She is powered by twin 600hp Cummins diesel engines which is the max hp available for a 35 Carolina Classic. The engines are currently covered by factory warranty and the factory recommended 1000 hour engine service was completed in June even though the engines are well under 1000 hours. Electric reel outlets have recently been installed in the cockpit.This boat is in Bristol condition, a one of a kind and a must see! Please call for more info or to a schedule a viewing appointment. 2001 Carolina Classic Only 590 Hours!! Tournament Speed !Exc. Condition!! The Carolina Classic 35 showcases the sensibility of the boat: classic design, rugged construction, and tournament-winning speed. From the comfortable detailed appointments in the cabin to the efficient power plant humming below, every inch of the 35 reflects its rugged offshore heritage. The fact is, there is very little else that any comparable or larger class sport-fishing boat can offer. The proven design, construction, craftsmanship and attention to detail is all integrated into the flagship Carolina Classic 35. The result brings you predictable reliability, performance and value for the dollar. And speeds in excess of 40 mph. The huge cockpit is uncluttered. The spacious helm deck L-lounge has plenty of comfortable seating for the crew. Below, you'll find convenience and comfort in the air-conditioned cabin, including 6'4" of headroom, a fully appointed galley, entertainment center and electric head with shower. In short, all the features you'd find a larger boat, except the big cost. Additional Specs, Equipment and Information: Boat Name PABO Specs Hull Shape: Deep Vee Dimensions LOA: 35 ft 0 in Beam: 13 ft 6 in Maximum Draft: 3 ft 0 in Headroom: 6 ft 4 in Deadrise: 18 ° at Transom Engines Total Power: 900 HP Engine 1: Engine Brand: Cummins Year Built: 2001 Engine Model: Diamond Performance Series Engine Type: Inboard Engine/Fuel Type: Diesel Location: Port Engine Hours: 584 Propeller: 3 blade propeller Drive Type: Direct Drive Engine Power: 450 HP Engine 2: Engine Brand: Cummins Year Built: 2001 Engine Model: Diamond Performance Series Engine Type: Inboard Engine/Fuel Type: Diesel Location: Starboard Engine Hours: 590 Propeller: 3 blade propeller Drive Type: Direct Drive Engine Power: 450 HP Cruising Speed: 26 knots Maximum Speed: 30 knots Tanks Fresh Water Tanks: (60 Gallons) Fuel Tanks: (400 Gallons) Accommodations Number of single berths: 2 Number of heads: 1 Electronics Autopilot GPS Depthsounder Plotter Repeater(s) Navigation center Radio Cockpit speakers VHF Radar TV set Compass Inside Equipment Microwave oven Electric bilge pump Refrigerator Hot water Battery charger Air conditioning Electric head Sea water pump Electrical Equipment Shore power inlet Generator Electrical Circuit: 110V Outside Equipment/Extras Cockpit cushions Electric windlass From the comfortable detailed appointments in the cabin to the efficient power plant humming below, every inch of the 35 reflects its rugged offshore heritage. The fact is, there is very little else that any comparable or larger class sport-fishing boat can offer. The proven design, construction, craftsmanship and attention to detail is all integrated into the flagship Carolina Classic 35. The result brings you predictable reliability, performance and value for the dollar. And speeds in excess of 40 mph. The huge cockpit is uncluttered. The spacious helm deck L-lounge has plenty of comfortable seating for the crew. Below, you'll find convenience and comfort in the air-conditioned cabin, including 6'4" of headroom, a fully appointed galley, entertainment center and electric head with shower. In short, all the features you'd find a larger boat, except the big cost. Manufacturer Provided Description Proven design, construction, craftsmanship and attention to detail is all integrated into the Carolina Classic 35. The result brings you predictable reliability, performance and value for the dollar. And speeds in excess of 40 mph. From the comfortable, detailed appointments in the cabin to the unstoppable powerplant lurking below, every inch of the 35 is a reflection of a rugged marine design heritage. Fishing is everything to a 35. The spacious helmdeck L-Lounge gives easy access to a fully equipped fishing platform featuring tackle stations, in-deck fish boxes, rodholders, plenty of storage space, command tower and the optional live well on the transom. In all, the most solid, stable weapon for trophy fishing yet produced. Then again, fishing isn't everything to a 35. Evenings out and weekends at sea demand comfort and convenience. Below, you'll find 6'4" of headroom housing amenities such as a powerful central HVAC system, a full stand-up shower, functional head, fully appointed galley including sink, stove, microwave and spacious double berth and settee. 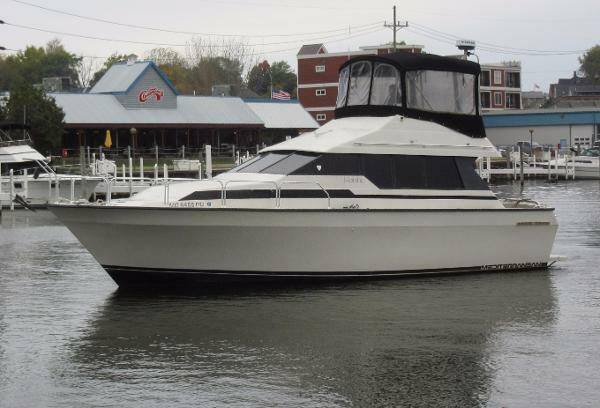 1989 Mainship 35 Convertible Spacious and affordable flybridge cruiser. Nicely equipped with heat & air, Onan generator, Furuno radar, windlass and more. 12 Foot 8 inch beam. Always freshwater, powered by twin Crusader 454s with just over 500 engine hours. Private forward stateroom, open salon-galley-dinette floorplan, stall shower. This is a great weekend retreat and comfortable cruiser. EQUIPMENT HIGHLIGHTS INCLUDE: TWIN 454 CRUSADERS, 350 HP, CLOSED COOLING; 524 HOURS ONAN 6.5 GENERATOR WITH 126 HOURS AIR CONDITIONING W/ REVERSE CYCLE HEAT WINDLASS BRIDGE ENCLOSURE FURUNO RADAR and much more! 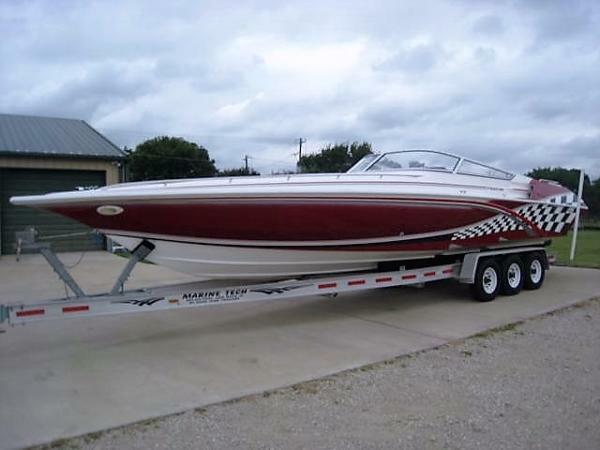 2000 Fountain 35 Lightning TWIN 525 CUBIC INCH ENGINES!MERCRUISER XR DRIVES!FRESHWATER USE ONLY!This Very Clean 2000 Fountain 35 Lightning is powered by twin custom built and blueprinted 525 cubic inch engines with only 50 freshwater hours since built 3 years ago and produce a total of 1,308 HP. Engines were built by Ramond Kittler with AMS Racing in Bossier City, Louisiana and no expense was spared. Engines were built with Comp Cams, lifters, Comp push rods, JD pistons, roller rockers, Brodix heads, balanced and blueprinted, and upgraded with Fountain Racing engine dress ups. Engines were dyno tested, Port produced 652 hp and Starboard produced 656 hp. The drives were upgraded to the Mercruiser XR drives 3 years ago and feature drive showers, 4 blade stainless steel props and hydraulic steering. All this gives this gem a top GPS speed 117 MPH on pump gas. 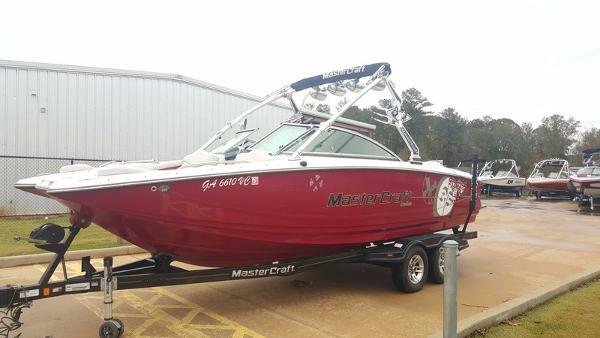 Other features include K-Planes with indicators, Northstar GPS, digital depth finder, Digital compass, cockpit carpet, BOSS marine high power stereo system with amp and subs, Bimini top with enclosure, wet bar with fridge, vacuflush head, Full cover and much more. Custom triple axle trailer included. In storage at our office and shown by appointment only.DON'T MISS OUT ON THIS ONE! 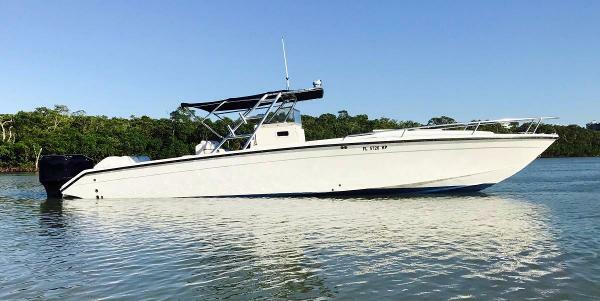 2009 Carolina Classic 35 Don't miss this beautiful, one-of-a-kind 2009 35' Classic with low hours. This gorgeous, ice-blue Carolina Classic is completely decked out and ready to hit the water. She is hands down the nicest one on the market. A large transom door and live well are located at the stern. In the cockpit, there are two large fish boxes, a pedestal with rod holders and a cutting board, a drink cooler, a fresh water sink, and refrigerated fishboxes. There is plenty of storage under the gunwales for gaffs and hoses, outriggers, and a brand new green stick professionally installed for tuna fishing. In the tower, rear and side facing LED flood lights are included for night fishing. The helm features a large L-shaped lounge, 2 custom helm seats, and heating/A/C units for additional luxury. She is equipped with new state of art Garmin electronics which include two touch screen Garmin displays, a Garmin auto pilot, Icom VHF, remote search light, FLIR night vision camera--interfaced with the Garmin display--, and a high end fusion stereo package. Additionally, there is a 10-inch Garmin display in the tower. Down below the deck, there are accommodations for four, a full galley, head, and a TV. She is powered by twin 600hp Cummins diesel engines--the max hp available for a 35' Carolina Classic. The engines are currently covered by factory warranty, and factory-recommended 1000 hour engine service was completed in June, despite the low hours. Electric reel outlets have recently been installed in the cockpit for additional ease while fishing. This boat is in Bristol condition, a one of a kind, and a must see! Please call for more info or to a schedule a viewing appointment. 2009 Mastercraft X35 2009 MasterCraft X35The MasterCraft X-35 is comparable in size to the X-Star; however, it has a different hull with a deep-V, which creates a great wake at recreational levels. And like all the big, deep-V MasterCrafts, the X-35's surf wake is solid. So load up that 800 pounds of ballast and charge itLess. With its massive, wide-open layout and smooth-riding deep-V hull, the MasterCraft X-35 wakeboard boat is a can't-miss for the big, multisport family. Better yet, with room for 16, let's call it a multisport, multifamily must-have. Like its larger siblings, the X-45 and X-55, the MasterCraft X-35 somehow feels even bigger than it's 102-inch beam - the maximum width you can trailer, by the way - because of its stretch-to-the-limit gunwales and space-creating pickle-fork bow. The riders in the family will be stoked, too, thanks to the standard Zero Flex tower, swivel X-Series board racks and three-tank ballast system. 2004 Fountain 35 Executioner. 2004 Fountain 35 Executioner - Powered by twin Mercruiser 500 HP 1000 hp - Only 87 hrs - Bravo 1 XR drives - 380 K planes - Latham hydraulic steering- 4 blade props - Halon system - New batteries - Cockpit carpet - Cockpit cover - Painted dash panel - Chrome throttles and shifters - Upgraded cockpit stereo 2 Kicker amps four 10 inch subwoofers two 8 - two 6inch speakers- 2 tweeters - Custom steering wheel - Depth finder- New Garmin never used GPS - Compass - Cabin sink - Cooler- Pump out Porto potty- New Vinyl Wrap - 100 percent fresh water - Trailer is available.. Qualified buyers may be eligible for Financing Nationwide Shipping and Extended Warranties. 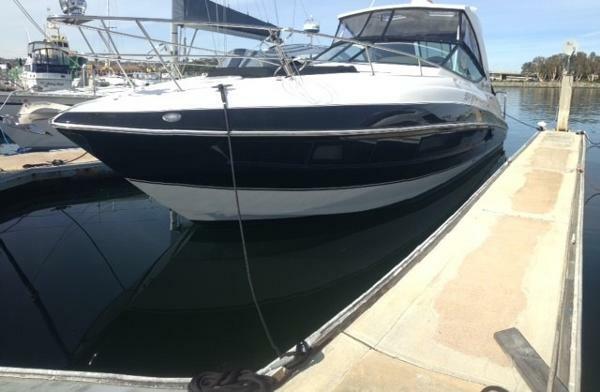 2016 Cruisers Yachts 35 Express Owner is moving up and wants offers! !This is one of the best looking boats in her class! The Cruisers 350 Express combines modern sportboat styling with luxury class accommodations. This perfectly designed boat brilliantly utilizes every inch of space. In her open interior floor plan you will enjoy plenty of natural light, making the area feel even more spacious than it already is. The beautiful walnut trim, faux granite counters and six vertical portholes make the accommodations very impressive for a boat this size. The U-shaped lounge aft in the salon makes a convenient place for eating or lounging and includes spacious storage. The cockpit, including a deluxe wet bar and double helm seat, also has a transom seat that folds down automatically converting into a full sun pad. In addition to her beautiful styling, she also has many great features including joystick controls, top of the line navigation electronics, walk-thru windshield to foredeck, twin Mercruiser 8.2 Bravo III engines with very low hours, and she even has a removable bait well for the occasional fishing adventure. Come see this amazing boat! 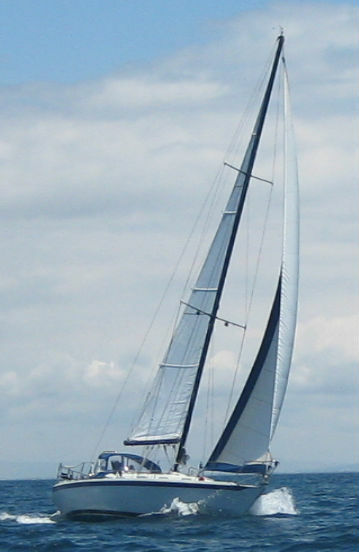 1999 Jefferson Marlago 35FS This is a very rare opportunity to owe one of the nicest center consoles on the water. For sale is a 1999 Jefferson Marlago 35 Cuddy. It is a truly amazing hull with two powerful Mercury EFI 250HP outboards. $25,000 in upgrades done within 6 months as follows:-Interior cushions to marine vinyl -New canvas on the bimini -New Garmin 7612xsv with the Blue Charts google earth overlay -New complete JL Audio sound system-six 6.5 speakers on a 600.6 amp -two 10inch subwoofer on a 600.1 amp -JL Audio marine head unit with full JL marine wiring -New VHF and antenna -New bilge pumps -New trim tab pump -New autopilot pump -Three super bright multi color LED underwater lights off the stern -10 multicolor LED courtesy lights-LED remote controlled spotlight. She rides like a dream. She handles heavy seas keeping everyone dry and comfortable. Incredibly spacious. She is the perfect boat for fishing but also the right boat for just a nice day on the water. She is still not even broken in yet with less than 600 hours on her. She is the perfect configuration and is the perfect boat. A real head turner and the envy of many. 786-942-2117FINANCING AVAILABLE!!! !